Save thousands on your new pool - April 26th - 28th only! Want to be swimming by summer? Buy now and beat the heat! Arrange a FREE pool estimate with one of our professional designers. We can't wait to build the backyard of your dreams. Why trust your dream to anyone else? We are America's Pool Builder. Get approved within minutes. Immediately know your budget and monthly payment. Choose from multiple interest rates and terms. Premier Pools and Spas is the largest pool builder in the United States of America. Which Pool Compliments Your Lifestyle? Get inspired by different Freeform pool designs. Get inspired by different Geometric pool designs. Get inspired by different Classic pool designs. Get inspired by different Small Pool designs. Get inspired by different Spa & Hot Tub designs. Get inspired by different Swimming Pool Features. Follow Paul Porter & Brian Porter on a brand new season of "Pool Kings". This father & son team run the World's Largest swimming pool company and build some of the most over the top swimming pools anyone has ever seen. Premier was called in to design a one of a kind pool for a small backyard in just 48 hours! We delivered on an over-the-top request to put a “spool” or smaller pool in the homeowners backyard and completely revitalize the purpose and space of the yard much to the happiness of the owners. It was a great experience working with Matt Blashaw and the rest of the crew at Yard Crashers and one that we are happy to share with our customers who’d like to see our flagship location in action! Watch what happens when Premier Pools is called in to completely transform one lucky homeowners backyard in just 48 hours! Premier Pools & Spas recently had the opportunity to work on the backlot of the Warner Brothers studio in Hollywood for the hit show “Animal Kingdom“. We were called in to build a pool for the show and delivered a phenomenal looking pool in record time, much to the happiness of the shows producers who were nice enough to give us a rave review on our work. But don’t believe us, watch this short clip for yourself. The Playscape pool was created for a homeowner who actually was not thrilled about the idea of building a pool in the first place, but his family was. Once the pool was built, the owner was able to see that the pool created the ability to spend more quality time as a family while doing something active. The backyard showpiece blends seamlessly with their home design by utilizing sharp lines and a modern design. The pool is unique in many ways but perhaps the most striking portion is that the hot tub is located in the middle of the pool. In order to get to the hot tub, one must either get wet or balance themselves on floating steps that lead to the baja shelf of the hot tub. 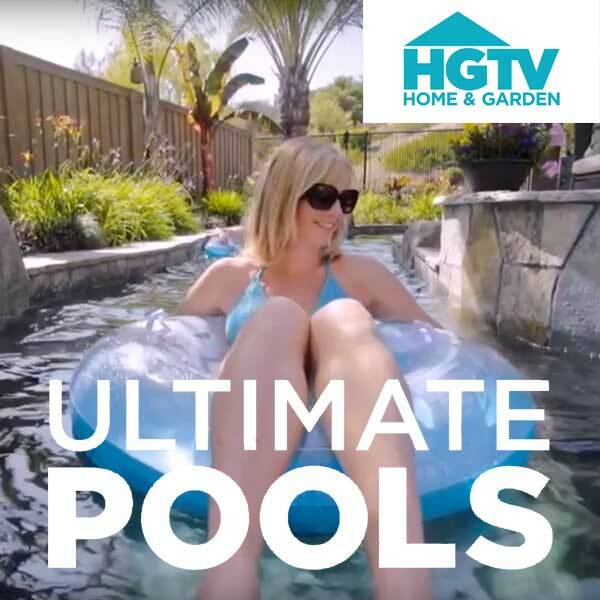 Premier Pools & Spas recently had the opportunity to appear on the DIY Channel again for a new episode of Pool Kings to build an over the top inground pool for the Layton family. With a backyard tailor made for a resort style pool, they were ready to build and wanted the best pool builders in America to tackle the job. Premier Pools appears on DIY Channel's Pool Kings to build a resort style pool. Thank you for considering Premier Pools and Spas to be your residential pool builder. We know this is an important decision and a big investment so we are honored to be given the opportunity to tell you our story and educate you on how swimming pool or spa should be built. With 30 years of pool building expertise, we have the knowledge and skills needed to transform what you envision into your ideal backyard. We don’t consider ourselves to be only a pool construction company. There is a lot more to the process than that. It’s an emotional purchase and we make sure that our staff is there before, during and after the construction process to inform and educate you. We take great pride in not only listening to your current needs and wishes, but also in anticipating your future ones as well. Because we understand the process so well, we are able to make your new pool construction go as smoothly as possible. Our team of professionals understands what is necessary for the proper construction and engineering of your swimming pool installation; whether you’re considering a freeform or geometric, large or small pool design, and regardless if is on flat ground or on the side of a hill. As a custom pool builder, we offer a wide array of options to ensure your end product is not only high quality, but uniquely you. Functional features like slides, Acapulco shelves, grottos and beach entries can be incorporated in the design of your in-ground pool to make it distinctive. You can also select decorative features such as waterfalls, colored lighting and mosaics to add ambiance and beautiful aesthetics. Our swimming pool contractors have been recognized for their innovative work and excellent customer service, achieving many national and international awards. This year, we secured multiple spots in the Pool and Spa News’ Top 50 Pool Builders list – an unprecedented accomplishment in the history of the publication. Although we are honored to receive these awards, it is the referrals and recommendations of our customers that mean the most to us. We’re also the nation’s largest company of pool builders. This means that our size allows us incredible buying power of high quality products, which translates into additional savings that we pass on to you. It also allows us to offer more comprehensive warranties, which can’t be found anywhere else. We are also able to assist you in finding pool financing, should you require it. As a leading builder of pools, we provide a total package of service, quality and selection to ensure you receive the highest quality product at the best possible value. The process of building an inground pool incorporates many individual steps and is often misunderstood as taking alot less time than it actually does. Fortunately in this video we've shortened the process to just 9 minutes flat! In real life, you can expect us to be in your backyard for a minimum of 6 weeks. We've put together this time lapse video so that you can see exactly how a swimming pool comes together from a rough looking hole in the ground to a sophisticated resort style swimming pool in just a few minutes. Why isn't the process so fast in real life? While we can obviously speed up a video, speeding up the process isn't anywhere near as simple or cut and dried. Quite often this is a stop & start process while we wait for permits, weather conditions, equipment, etc. What we do strive to do is keep our customer informed throughout the entire construction of the pool so that there are no surprises and ensure a remarkable customer experience. We strive to provide each and every one of our customers with an outstanding customer experience. It's not enough to be a competent and honest builder - we want to ensure that our customers feel like they've been taken care of every step of the way. This is why it's so important to us that we are living up to the reputation we've worked so hard to establish over our 30 year history. What differentiates us from so many others is that we genuinely care about our customers wants, needs and concerns and work hard to make them feel like their issues are important and taken care of in a timely manner. Pool & Spa News evaluated thousands of pool contractors across the nation last year and we were proudly selected for providing the best customer experience. This honor is especially important to our organization because it's a testament to how hard we work to make sure that we are delivering on our promise to treat each and every one of our customers with the unparalleled level of service that they've come to expect from us. Don't take our word for it though, just listen to what our customers think of our organization.